Learn how to make easy strawberry cheesecake recipes. What makes them easy? Many people are looking for these quick and easy recipes. There are different reasons for this but here is my reasoning. Sometimes I get a craving for cheese cake and when I do I want it NOW. Easy cheesecakes are perfect to make if you don't have time to make a strawberry cheesecake with cream cheese or the ultimate cheesecake which needs two days. I do not want to wait until I mix one up, bake it for maybe an hour, let it cool down and then refrigerate it until it gets cold. If I have to wait that long when I am dying for a piece of this delicious dessert, I may as well drive to a restaurant to satisfy my craving. If not, in all that time I would be craving something else. So why would you want to know how to make easy strawberry cheesecake recipes? The first thing would be no baking or minimal baking reducing the time needed and the cool down process. Besides not baking the dessert, many ingredients can be used in making cheesecakes that will make the process easier, quicker and also add to the delicious flavor. When you learn how to make easy strawberry cheesecake recipes gelatin is frequently used in no bake desserts. An unflavored gelatin helps to set up the dessert. By selecting a fruit flavored gelatin it also can add great taste. 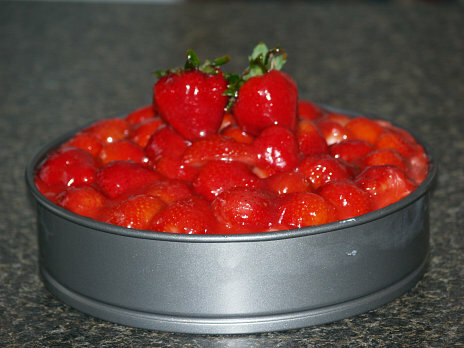 Many prepared products help to make the production of strawberry cheesecake recipes much easier. Already prepared crusts are available for cheese pie recipes or crumbs are ready to quickly put together graham cracker crusts. Packaged cookies, lady fingers, sponge cake or angel food cakes offer some quick liners for cheesecake crusts. These crusts could not be used if making a typical cheesecake like the Amaretto Cheesecake which requires the crust to be baked in water. Instant pudding mixes add great flavor when combining it with cream cheese, ricotta cheese or other favorites. Products like Cool Whip, a whipped topping folds into a cheese mixture quickly adding light airy bulk to the dessert. Can pie filling is a good and easy substitute for the fruit. All it takes, for example, to make simple easy strawberry cheesecake recipes is some beaten softened cream cheese, a little strawberry gelatin for flavor and whipped topping for lightness. Fold all of this together with a few fresh sliced strawberries or top finished cake with pie filling. Turn mixture into an already prepared crust and you have an instant cheesecake. How delicious! Crumble cake and layer in flat dish or pan. Beat together softened cream cheese, vanilla and sugar. Fold Cool Whip into cream cheese mixture; pour into cake lined crust. Mix together strawberry slices with the strawberry glaze; top cream cheese mixture in pan. Refrigerated until cold and set. NOTE: This sets up soft and needs to be served from the dish; a flat dish. Only one of my easy strawberry cheesecake recipes is made in a microwave. This one is easy, quick and since they are small the cool down time is faster. Place cream cheese and egg in small mixing bowl; add sugar and vanilla and beat until smooth. Line plastic cupcake tray or glass custard cups with paper cupcake liners. Place a vanilla wafer on the bottom of each liner and stand 3 cookies up along the sides. Fill each line half full with cheese mixture. Bake six at a time on half power for 2 ½ to 3 minutes or until cheese mixture is set. Half way through baking turn cakes; when set move to cooling rack. Allow to cool and spoon strawberry pie filling over each tart. This is one of the easy strawberry cheesecake recipes that is made in bar form. These do not have to be real cold before eating. They are quite easy to make with various prepared ingredients. Slice cookie roll ¼ inch thick; place slices in bottom of ungreased 9 X 13 inch baking pan. Bake in preheated oven at 375F degrees for 12 to 15 minutes or until light brown. Gently spread cookies with strawberry preserves. Combine remaining ingredients in a large bowl and beat until smooth. Pour mixture over strawberry preserves in pan spreading to the edges. Bake for 25 to 30 minutes or until knife inserted comes out clean. Cool and cut into squares or bars. This is one of my easy strawberry cheesecake recipes even though it is not made with cheese. I call it a sour cream cheesecake recipe because it has a texture like cheesecake with a delicious rich flavor. Sprinkle gelatin over water in a small bowl to soften. In medium saucepan, combine 1/3 cup sugar, salt, sour cream, milk and egg yolks; mix thoroughly. Cook over medium heat 10 to 15 minutes stirring constantly until very hot; DO NOT BOIL. Stir into soften gelatin; cover surface with plastic wrap. Refrigerate from 45 to 60 minutes until slightly thickened; fold in whipped cream. Spoon into cooled crust; refrigerate until set about 2 hours. TO MAKE CRUST use a 10 inch microwave quiche dish or glass pie dish. Place butter in dish and melt in microwave on high for 1 minute. Add crumbs and sugar to dish; press firmly on bottom of dish. Cook on microwave high for 1 ½ minutes rotating the dish one time; set aside. TO MAKE FILLING beat cheese in microwave mixing bowl (With handle) until fluffy. Gradually beat in canned milk until smooth; add eggs and lemon juice beating well. Cook on medium high until hot stirring every 2 minutes; pour into prepared crust. Cook on medium power 6 to 8 minutes until center is set rotating dish once. Top with sour cream; cool to room temperature and chill overnight. Top with spoonful of strawberry pie filling to serve.